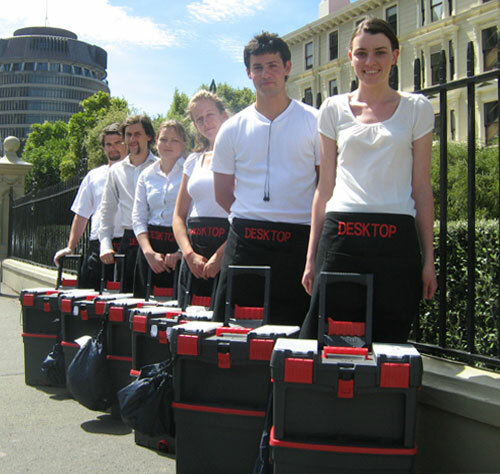 Desktop provide an on-site cleaning service through out the lower North Island region. Desktop covers, Wellington, Kapiti, Manawatu and the Wairarapa. We are also happy to consider other regions. Ranges from a one off or regular cleaning service to suit your requirements. We are pleased to clean during normal working hours, after 5, or on weekends. There is no extra cost for out of hours cleaning. Cleaning only takes a few minutes for each piece of equipment. Our services are conducted with a minimum amount of disruption. All Desktop staff wear the Desktop uniform and are fully trained by the Desktop owner, to clean your equipment using environmentally friendly, safe and non-toxic cleaning products. Desktop does not request you to sign a contract. However, if this is your company policy, we are happy to put one together. Desktop has been in business now for 18 years. We are proud to be an Owner/Operator 100% New Zealand. Desktop uses cleaning wipes, Scented or Unscented wipes, microfibre cloths and soft brushes to clean equipment. We do not vacume, spray, use air compressor cans or use liquid on your equipment. On your screen we use a damp microfibre cloth which was recommended by computer screen manufacturers. Air New Zealand identified a 52% improvement in sick days lost after the introduction of a Telephone/Computer cleaning service. Many people cough, sneeze and inadvertently spit whilst on the telephone, as well, many people forget to wash their hands in the toilet areas, increasing the risk in the spreading of disease. How many of us eat over our keyboards leaving behind crumbs in the keyboard. Telephones & Computers are contaminated with up to 25,123 germs per square inch. Using disinfecting wipes will reduce germs & bacteria by up to 99.9%. Telephones have 500 times more bacteria than the average toilet seat. The American Industrial Hygiene Association, in their Swine Flu Pandemic press release. Under "germ control", recommends businesses provide resources and a work environment that promotes that work surfaces, telephones, computers and frequently touched surfaces and equipment be kept hygenically clean. Or you can call Lynea on 027 4408815.